Private investigator Toby Peters may have worked for some of the biggest stars in 1940s Hollywood—Clark Gable, Fred Astaire, W.C. Fields—but it’s the bit players in Kaminsky’s freewheeling series (Never Cross a Vampire, 2000, etc.) that get all the laughs. This time it’s his daffy landlady, Mrs. Irene Plaut, who steals the show by announcing calmly while serving up potato surprise (the “surprise,” she confides noisily, is sugar-browned Spam) that Fiona Sullivan is getting married. 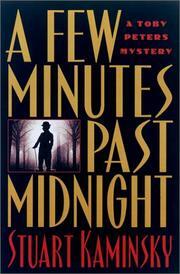 Now Toby and his sidekicks—immense Jeremy Butler, diminutive Gunther Wherthman, and sadistic Sheldon Minck, D.D.S.—have been knocking their collective heads together trying to find Fiona ever since a knife-wielding visitor warned Charlie Chaplin, Toby’s latest client, to leave her alone. Mrs. Plaut identifies the mystery lady as a fellow boardinghouse owner lately engaged to Howard Sawyer, a tenant whose description matches that of Chaplin’s midnight nemesis. Chez Sullivan, Toby discovers that Sawyer’s disappeared, leaving behind a list of nine names, including Fiona’s. Toby’s mildly alarmed when he discovers that the first five women on the list are dead, but alarm turns to panic when #6, Fiona, and #7, Elsie Pultman, both disappear. Then he has no choice but to turn to his brother, Lt. Phil Pevsner, still cranky at Toby for ditching the family name, for help in tracking down a stalker who may have developed a taste for murder. An ingenious twist on the old serial killer chestnut, with the usual manic Peters ménage obbligato.